Technical analysis is a renowned tool in finance to measure the behaviour of price and volume changes that are related to securities. Technical analysis is used to predict the price movement with movements in the stock market. By focusing on price behaviours, analysts become able to see what is happening in capital or stock market and what the key players are thinking about the market. Better trading decisions can easily be made by technical analysis. This analysis aims to seek and measure the market sentiments at the most basic level means such pessimistic, optimistic or uncertain about future prices. So, technical analysis primarily focuses on the ways of making profits from trading regardless whether a security is owned for saving purpose or not.In the era of information and communication technology, use of such tools for investment policies and decisions are fundamental to business success. Technical analysis is exactly what is required now and in upcoming period. The Technical Analysis certification program from Brainmeasureswill equip you to efficiently and effectively analysing the different movements in prices and volumes of securities and shares in the market. This will also provide the ease in assessment of securities for investment purpose. This will also able you to assess which securities are blue chip or which might go to bad credit rating due to undesirable moments that are adverse to overall market. This a unique certification in terms of contents, design and delivery of knowledge which will allow you to become proficient with changing needs of investment and business sectors. This online certification will provide you a competitive edge in both analysing and decision making for investment in different securities that leads to optimization of profit. Throughout the course, you will learn about different requirements and components of investment strategies, desirable and undesirable environments, market movements and sentiments etc. Apart from the course mechanics, a comprehensive exam is also covered in the program in order to assess your learnings and skills as well as hone your knowledge about the field. After a successful attempt, you will be on right way to get your Technical Analysis skill certificate from Brainmeasures. This will be definitely an added skill to improve your Resume and will make it easier to get the desired job. Entitlement of Technical Analysis certification from Brainmeasuresalso translates to increase in income and better flow of wealth generation. The average annual salary for those who hold management and investment analyser positions in different business is $90,000 and this amount may vary significantly based on the type of and nature of organization, available investment opportunities in the market, location, popularity of the business and related products or services demand and experience of the business analyser or manager. 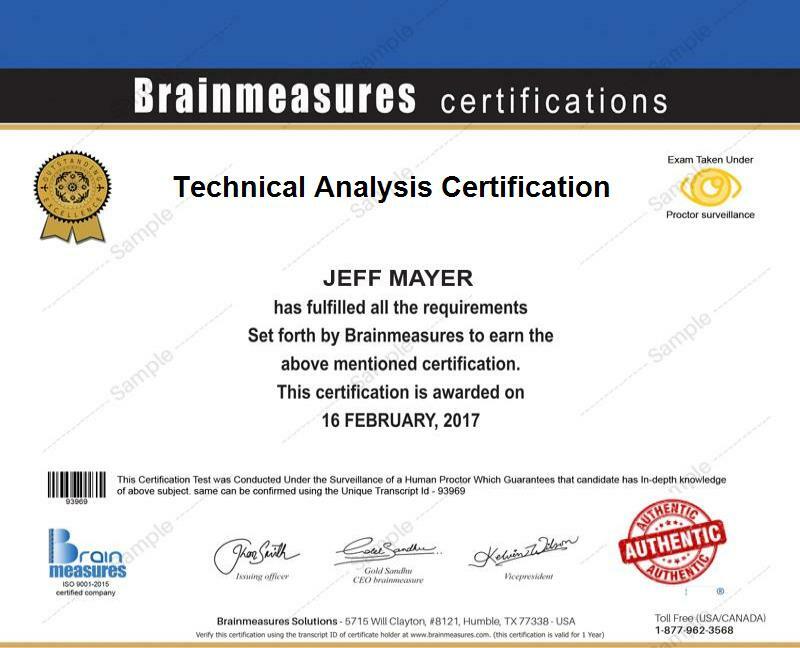 There are no specific requirements or qualification needed to get admission in the Technical Analysis certification program offered by Brainmeasures. However, it is safe to assume that the entire program is primarily directed towards individuals who wish to become more familiar about the investment opportunities and strategies to maximize their returns by investing into the securities that are being traded in the stock or capital market. The course is ideal for aspiring students and teachers of finance, investment analysis, market or business researchers, business executive, brokers, fund managers and prospective investment leaders who aim to learn different Technical Analysis techniques with practical hands on such techniques with real world case studies.